The quickest way to take the 3D scanning SDK for a spin is to build and run the example app: StandardCyborgExample. After testing that out, we’ll give a brief overview of the Standard Cyborg APIs, then run through how to integrate 3D scanning into your existing app. Want to dive into the API reference? Head over to the README. Further questions? Take a look in the FAQ, or feel free to ask us directly! StandardCyborgExample is a bare-bones example app that takes a 3D scan using StandardCyborgFusion and visualizes the result using StandardCyborgUI. NOTE: This app doesn’t build for the iOS Simulator due to lack of support for Metal. Core 3D reconstruction algorithms live here. Provided as a compiled binary. A Swift interface to the Standard Cyborg Platform API, which provides storage and analysis for 3D scans. Scan analysis is performed entirely on the servers. The 3D reconstruction algorithms exist entirely within StandardCyborgFusion.framework. But if your app doesn’t already have a pipeline set up for streaming and rendering 3D depth frames from the camera, it’s often fastest to leverage the some or all of the classes within StandardCyborgUI to build a typical scanning experience. A typical pipeline is [take scan] > [preview scan] > [save scan]. 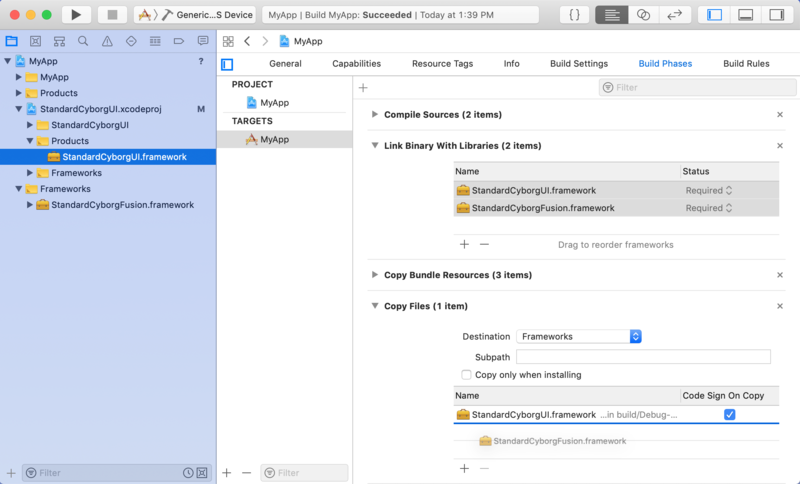 Second, add the Standard Cyborg frameworks to your Xcode project or workspace via your method of choice. NOTE: CocoaPods support is coming soon! The following uses a git submodule to manually integrate with our repository. Feel free to use the dependency management method of your choice! When the user and app are ready to begin scanning, present a ScanningViewController. If the app hasn’t requested camera access yet, the camera permission dialog will be presented first. With camera permission granted, you’ll now be in the depth preview mode, ready to start scanning! The user can start and stop scanning by tapping the shutter button, just like recording a video. Once a scan completes successfully, ScanningViewController will notify your view controller, its delegate, that it finished building an SCPointCloud! Next up, let’s visualize that scan. After a successful scan, the user will now see the point cloud! But wait, how can the user do something useful when the scan looks good? We can customize the scan preview UI and know when its buttons are tapped by talking to its leftButton and rightButton. // Do your thing with the scan here! If you want to further customize this scan preview UI, feel free to embed this view controller in your own, subclass it, or write your own! File management is left completely up to you, but StandardCyborgFusion provides convenient methods for serializing and unserializing an SCPointCloud to/from disk using the PLY format. Let’s save that scan to the user’s documents directory! Scan analysis is performed on the Standard Cyborg servers. Classes within StandardCyborgNetworking provide a convenient interface to upload a scanned point cloud for analysis, then digest the analysis results. It is also possible to implement this yourself by using the Standard Cyborg Platform API. 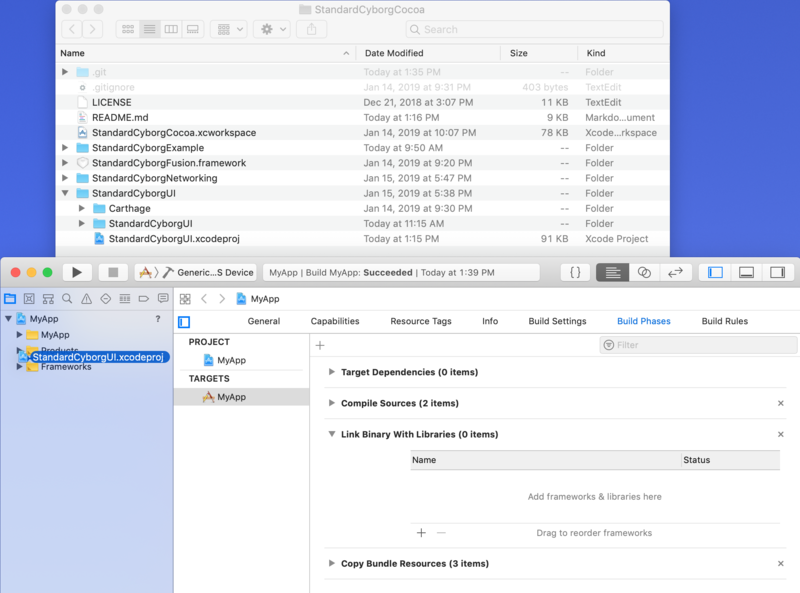 To provide the fullest level of customization for your app, you can skip the StandardCyborgUI classes and interface directly with the core scanning algorithms in StandardCyborgFusion.framework. The API documentation for SCReconstructionManager details how to do this.